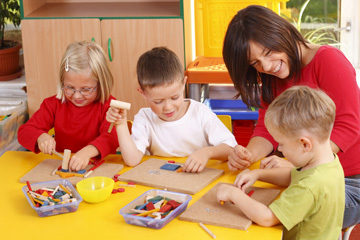 We believe that childcare is a very important extension of you and your child's family. We will encourage your child to develop at his or her own level. With guidance and understanding they will gain confidence of self-importance and have the opportunity to expore their world in a safe, caring and controlled environment. Closed for nine paid holidays a year: New Years Day, Easter Monday, Memorial Day, Independence Day, Labor Day, Thanksgiving and the day after, Christmas Eve and Christmas. Little River Child Care will follow Minot Public Schools for storm closures. All employees are required to be CPR and First Aid Certified. We are a participant in the USDA Food Program. All meals are nutritionally balanced. Enrollment: Children are accepted for enrollment based on space availability. Waiting lists are maintained. A licensed preschool for children ages 3-5 is taught by Misty Weed. Misty has 15 years of experience in child care and preschool.